It started out, driving on the roads east of Calgary it was pretty windy out but I found this Brewer's blackbird. The sun had just dipped behind a cloud and I waited and waited for it to come back out. 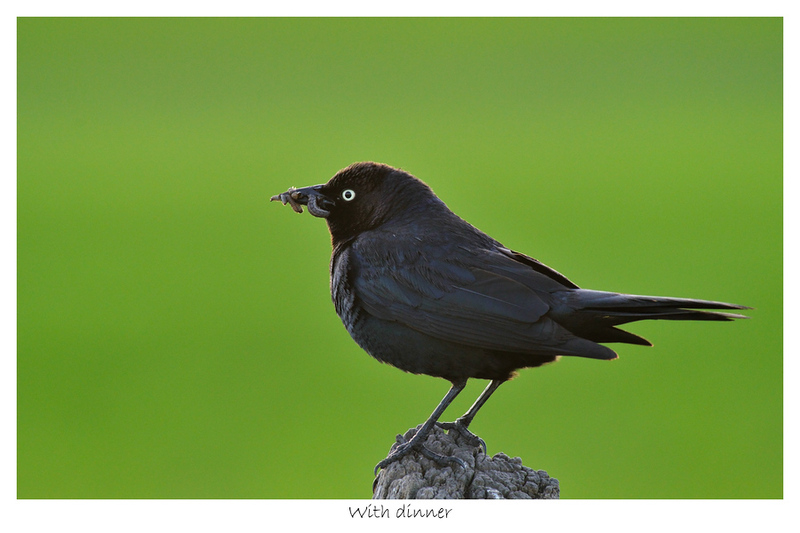 The bird was kind enough to sit on the post with a mouthful of grubs and pose for me. I like the tiny bit of rim light here that gives definition to his black feathers. He's standing against a field where the plants are young and green. The long lens blurs the background nicely. 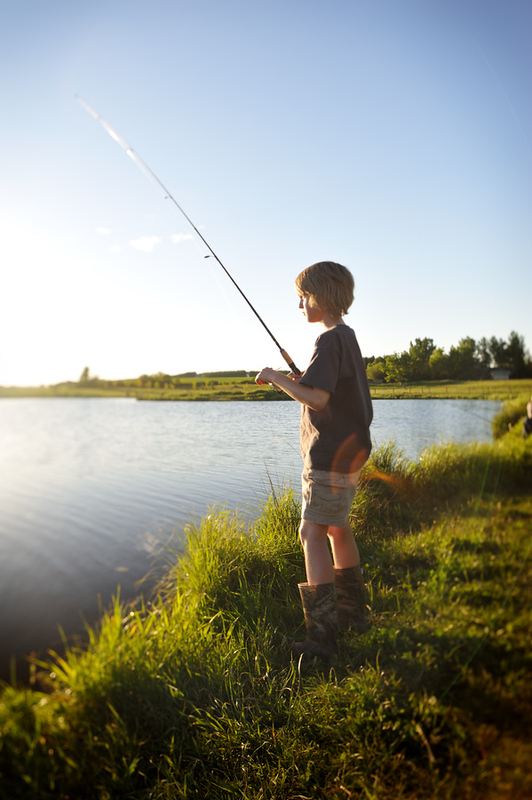 Conor and I made our way out to Dewitt's pond for some evening fishing. The kids got me a fishing rod for fathers day and this would be my first chance to try it out. The pond is pretty close to our house so it's easy to make a quick trip out there. Conor and I had planned to to head out on Sunday but he had fallen off some playground equipment and his wrist was hurt so we ended up spending a few hours at the clinic instead. The evening was beautiful.. the second day of summer was living up to expectations. We didn't end up catching anything but the guy beside us landed one and some of the other guys caught a couple. The fish were definitely there as they were jumping all over the place. Conor used a spinner, and I started with a spinner but tried a bobber later on. I can't believe the first day of summer is here already. I've been trying to get out with the camera this spring and take more pictures. Some of the problems I'm having with processing and posting are all mental.. I love taking pictures. 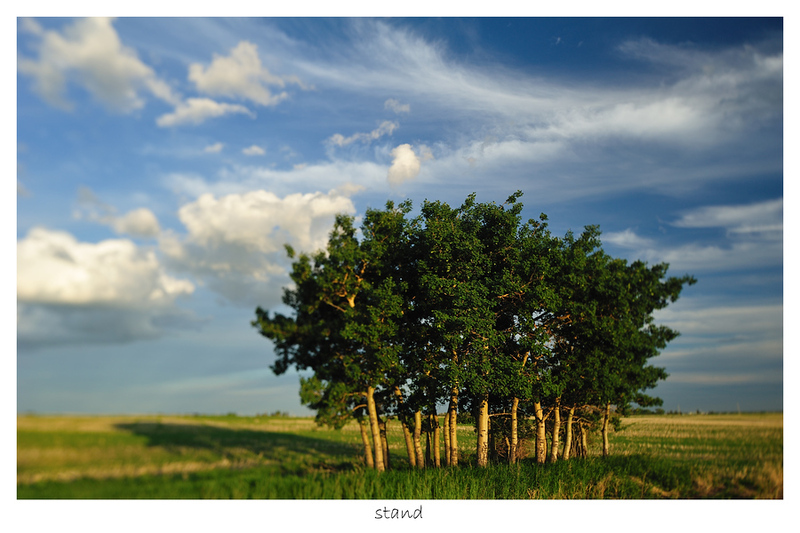 I don't necessarily love key wording and making up the titles to the pics.. that's why your reading things like "stand" as the title. It's a stand of trees in the field. What really drew me out tonight was the clouds. They were amazing, and with the sun going down, I had to get out in case the sun was going to catch them and light up the sky. So I drove just east of the city towards 100th street where I regularly look for hawks and owls. I haven't seen owls here for ever but I do keep looking for them. I parked the car and walked across the field after putting on my big rubber boots. I didn't know if the field would be wet and muddy or not. It wasn't really wet but when heading back to the car I did find a stand of water that I tried to walk through. Not far in I decided that the water would eventually be deeper than my boot was tall so I backtracked and went back across the field the way I`d come. For this photo, I walked around these trees at least ten times brushing off mosquitoes and taking various pics - trying to find an interesting composition. I really like how this shot turned out. I hope you do too. Click here to see some more photos from today. I know ( as of today ) that I have a lot of catching up to do to match my blog posting with the number of photos that I've posted over at my smugmug site.. last post here was April 1st. A lot has happened since then. My goal will be to go and backfill those posts so I can tell you what happened and bring some context to the photos that have been uploaded.